This week in our garden we've been harvesting loads of new things which has given our kitchen table a much needed burst of 'flavour'!! 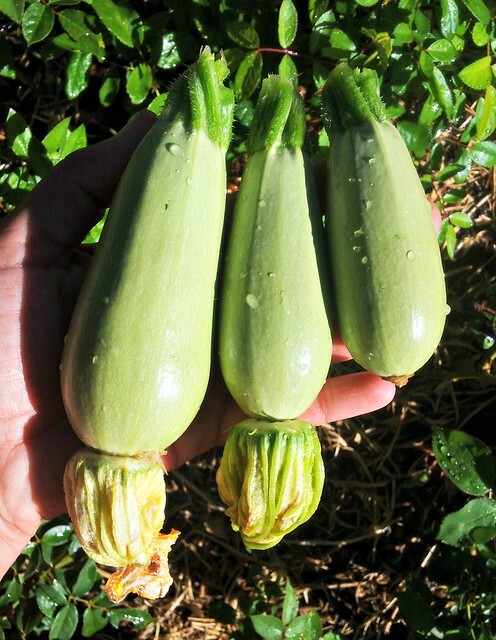 We have 5 Green Lebanese Zuchinni bushes and they are steadily producing approx 3 fruit a day - we're enjoying these thinly sliced, fried with garlic and butter, then stirred though some good hand-made pasta, or roughly chopped and added to a stir-fry. But my kids favourite is simply grated and added with a few other goodies to eggs to make a delicious fritata. The next recipe on my list (when my stocks get up of-coarse) are some 'bread and butter' pickles! 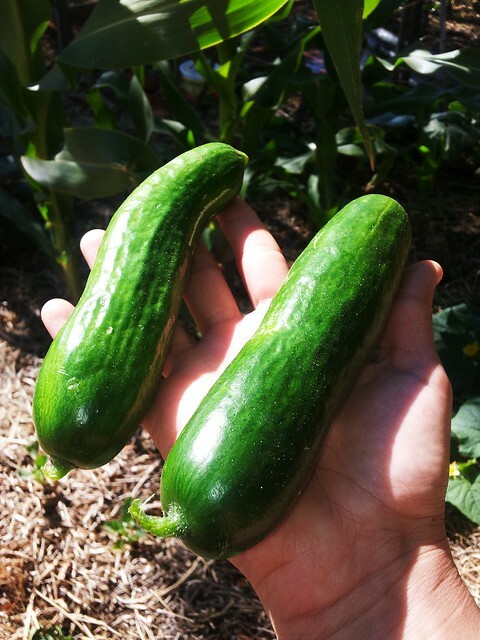 My mini muncher cucumbers are ripening as well and the girls are finding at least 1 plump and ready for the picking each and every day! 'Mini-Muncher' is my favourite variety of cucumber and I've been growing it for 4 years now. It's a prolific fruit-er and very rarely gets disease or attacked by pests. The fruit is picked when they are approx the size of your hand, are burp-less and seedless (well the seeds are too tiny to notice anyway). The flesh is a gorgeous yellow-y green colour and they are super sweet and juicy!! 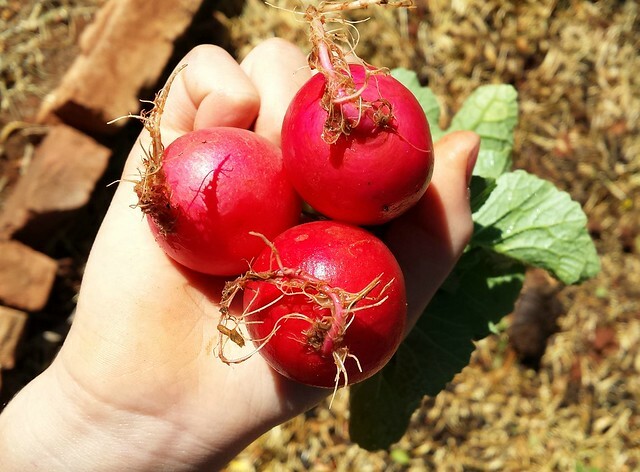 In my opinion, a really gorgeous fruit (vegetable) to add to your vegetable garden!! So... What have you been harvesting this week in your garden? 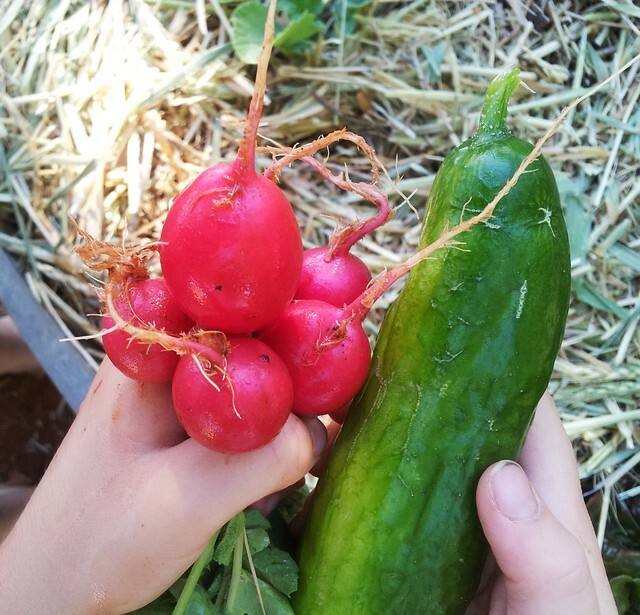 Is the vegetable garden a family affair at your place? Do you get the kids in on the action too? Yum! The cooler weather down in Melbourne means everything is a bit slow this year. The leaches are looking good but everything else is tiny. Your produce looks beautiful and delicious! It has seemed strange to not have a garden this year, but honestly, I don't know when I would have found time to manage it. A good 40 years of fresh veggies and canning and freezing it all up in the late summer and fall were the norm around here. My husband was the gardener, all the hard work helped to feed us. Every family needs a garden. My girls use to have a spot too for their radishes and carrots. They loved watching their plants grow. Some days they checked the stuff about every hour when the sun was up. Loved those memories! 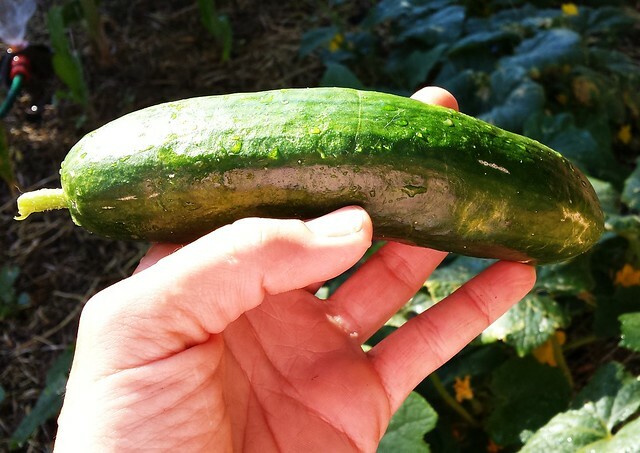 Zucchini are such versatile vegies. Our seedlings are having a tough start- with something eating them within a couple of days of being planted out in the garden beds, it's a bit frustrating really. Oooh, those zucchini look great and love the idea of frying them with garlic and butter!! I have pulled out my well and truly dead sweet peas and will be replanting with green beans. I threw some rocket seed in my herb trough and planted out some "Spanish" basil (I think that is what my neighbour called it when she handed me some seedlings). Tom loves gardening at school with the Stephanie Alexander Kitchen Garden program they run but isn't interested in gardening with me. Daniel does however and was busy collecting lady bugs when we were gardening on Friday afternoon. Tom is so lucky to have the Stephanie Alexander garden at school and I'm sure in tome will love to garden with you too.. So far nothing is growing in my vegie patch! I'm desperately trying to rectify the situation but not getting very far! Lots of lovely fresh colour . . . Just me and the cats do the gardening here, but I love working in the garden with the kids at school. are you reading my posts?